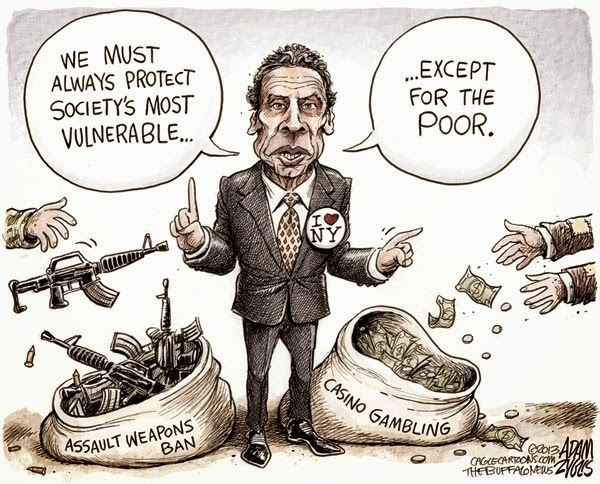 Nowhere is the craven opportunism of Andrew Cuomo more evident than in his own words. When he was facing opposition in the Working Families Party, he was a liberal, a progressive, a true blue Democrat. He was gonna reign in those nasty independent Democrats, the ones who acted like Republicans, so our bold UFT and NYSUT leadership made sure that scary Zephyr Teachout didn't take that mantle from him. And when Teachout mustered the temerity to run against him in the primary, we heard not a word from him. Except that this deal to appease progressives in WFP? Forget about it. Of course, he spent a few millions fighting Zephyr in court, claiming this Fordham law professor who's been working in NY since 2009 commuted to Vermont or something. This is the sort of sterling judgment we can expect from our fearless leader. Now that she pulled over a third of a vote from him in the primary, and things look safe, he can tell us what he really thinks. The governor also noted how he took on the teachers union to bolster accountability in public schools. We all know how that's worked out. Aren't things in your classrooms just humming now that you're being observed 200 times a year? Don't you feel valued, trusted and professional? And isn't it a fine thing that teachers are being evaluated by test scores even though there is not only no evidence to demonstrate this is a valid measure, but there is also quite a bit of evidence that teachers are a minor factor at best in such scores? Governor Andy has declared himself to be a "student lobbyist," but he's enabled a system in which people who vote no to supporting public schools get more of a voice than those who vote yes. In New Paltz, 59.5% of voters said yes to a budget and it went down. That's the sort of thinking we get from our pal Andy, and the leader of the AFT actually made robocalls for his conservative running mate just to make sure Zephyr's partner Tim Wu didn't actually capitalize on that NY Times endorsement. Don't forget Andy's Gap Elimination Adjustment. Not only is it virtually impossible for localities to raise money for public schools, but they're concurrently receiving a whole lot less state aid. That's a recipe for disaster. And lest you're thinking about Astorino as an alternative, he says Cuomo's tax policies don't go far enough. We don't need Cuomo, and we especially don't need Astorino, the second coming of Scott Walker. There are no good choices from the major parties, and we as unionists are partly responsible, by enabling leadership that shoots down a shining star like Zephyr. If you support public education, support the only standing candidate who shares that sentiment--Green Howie Hawkins.